So this blog post is in response to a question I get asked all the time – online and in person at skirmishes and now that I’ve ran the new line of Nuprol BBs for a fair few months and through my entire arsenal of RIFs, I feel like I can finally provide you with my thoughts on them. 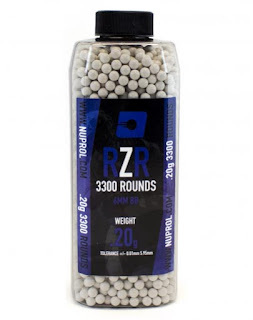 I think it’s fair to say we’ve all heard about the infamous first batch of Nuprol BBs, I tested these back in 2014 and whilst I had no issues with the .28g BBs, I unfortunately did have issues with the other weight BBs which included jamming, misfeeds etc – all information that I relayed back to the team. After taking on board feedback from customers, the team at Nuprol went back to the drawing board and after rigorous testing have now released a new line of BBs, ranging from 0.2gs to 0.4gs, but how do they stack up against their competition? 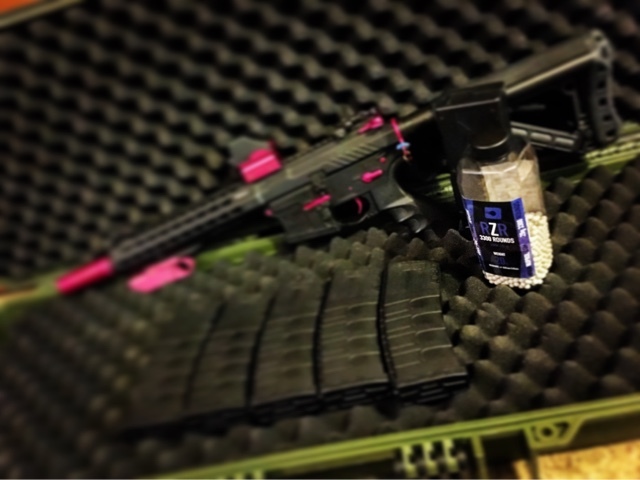 This review is based on the 0.2g BBs and 0.25g BBs used in a G&G Armament CM16 SRL, ASG Scorpion EVO 3A1, Krytac Trident SPR, G&G RK74-T, a WE Sig P226 and the WE M&P. My usual go to brand of BBs for most of my time in Airsoft has been the tried and tested Blaster BBs from ASG, I have swayed and sampled other brands over the last couple of years but Blasters are the ones I always end up going back to. I did really like the pink .28g BBs from the first batch of Nuprols beebs as like I said, I luckily didn’t have any issues with that weight so when the team brought out their new line, I jumped at the offer to test them to see how these new ones compared to the old. Danny and Ross kindly sent over a package full of 0.2g and 0.25g BBs – the former for CQB and the latter for when I play MilSims and Urban games. First up on the agenda was the 0.2g BBs which I have ran through all of the guns listed above at my home site Strike Force CQB. 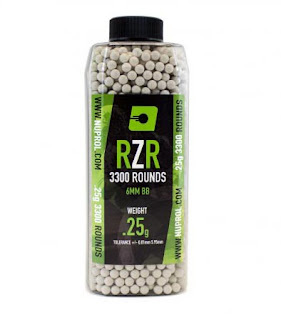 I usually use .2g BBs for CQB because there’s no wind and no obstacles like undergrowth etc and also handed a few bottles out to friends and players on my visits to get as many opinions as I could. I found that the .2gs ran well in all of my own rifles, which range from beginner RIFs such as the G&G Combat Machine to more advanced RIFs like my Evo. I had no jams or misfeeds. Everything ran smoothly. For the .25gs, these were my choice for the urban setting of The Fire Service College in Moreton in Marsh for HTIS Operation Blue Fox 2. I use a heavier weight for urban and outdoor sites because of wind and undergrowth, and I’m pretty happy to say that the results were consistent with those of the 0.2g beebs for this event I used my CM16 and the EVO, both RIFs ran well with no feeding issues or jams. I really feel that Nuprol have taken the feedback given to them and worked on a product that is really affordable and of high quality for the end user. 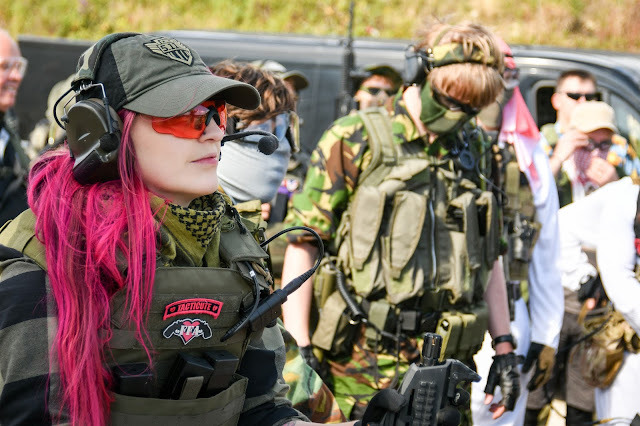 I am also glad to see how well the new line has been received and how Airsofters responded to them after the last batch. One thing I really like about the new line of BBs is the new bottle design, it’s bigger so holds 300 more rounds – great value for money and the new shape has two flat edges to prevent spillages (obviously some will spill out depending on how its dropped/knocked etc but the new bottle helps prevent the whole bottle emptying. The bottle is also a misty black colour which I think looks really smart. 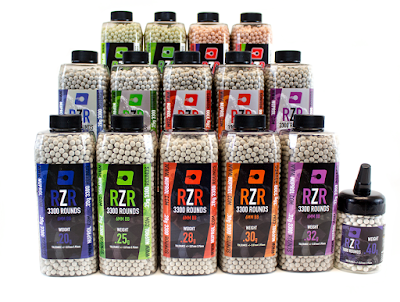 The bottles are colour coded to distinguish their weights but the BBs are white – I think that is my only complaint, I loved the colour coding of the BBs in their first batch! Prices are pretty similar from across the board. At Land Warrior prices start from £6.99 for a bottle of 3300 .2gs! Check them out here!